Oh the Places You’ll Go (When I grow up…) writing activity | My Attempts at Being Creative! Tuesday to continue our Dr. Seuss theme we read Oh the Places You’ll Go. 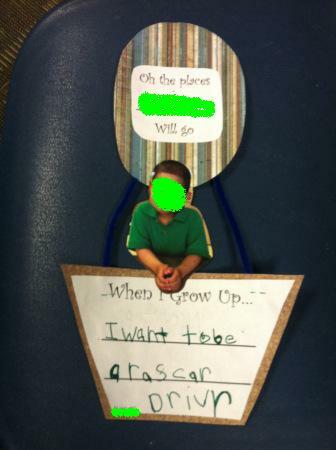 The students then finished the writing piece When I grow up… I had them write what they want to be when they grow up. Then I took a picture of them (I told them to act like they were holding the balloon or were up really high and only a few students did something). I love the ones where it looks like they are leaning on the basket of the balloon. These turned out really cute and I have them hanging from the ceiling in the classroom. I went to Hobby Lobby (50% off scrapbook paper) and created balloons and baskets. Then I cut a pipe cleaner in half and stapled the top of the balloon and the basket to each of the ends of the pipe cleaner. This worked out well just in case I had to adjust the length of the pipe cleaner to fit the picture. 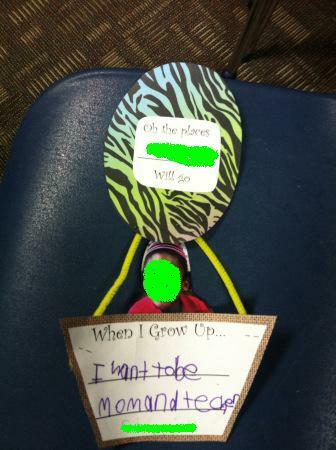 Trackback: When I grow up activity poster for Kindergarten | My Attempts at Being Creative!